"Five star accommodation in a super convenient location at a price you can afford!" Century Park Motor Lodge offers a great range of luxury accommodation options - but they all have in common the comfort, facilities and high level of personal service for which they've been Internationally rated #1 Hotel in the South Pacific (TripAdvisor, January 2012). Century Park is one of the NEWEST motel establishments on offer in Nelson, NZ - opened in October 2009. Motel guests are offered a choice of 14 well appointed self-contained apartments - all housing luxury features that belie the price. Conveniently located right at the heart of beautiful Nelson City, a safe 5 minute stroll from the Nelson CBD - walk to Restaurants, Cafés, Museums, City sights and great Shopping. The Nelson Region proudly boasts the highest sunshine hours in New Zealand and abounds in countless outdoor tourism opportunities, world-class wineries, stunning natural beauty and a world famous Arts and Crafts scene. Most activities are within 1 hour's drive from our central Nelson accommodation. 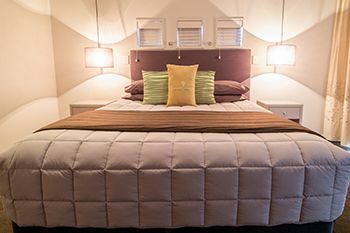 Situated at the centre of the country, Nelson is one of New Zealand's oldest cities and our motel accommodation provides the perfect base from which to experience the city's unique surrounding regions and enjoy real Kiwi Hospitality and tourism. Breathe easy - Century Park is proud to be TOTALLY SMOKE FREE (anywhere on the property) - a unique feature which our guests highly appreciate. Each apartment has been beautifully decorated, housing all the modern comforts you would expect from the pinnacle in luxury hotel apartment rooms. LCD Flats Screen TV - 32"
We provide many great extras for guests to enjoy, such as a Complimentary Bikes, free parking, book library and a complimentary DVD library. Continental breakfasts can be provided for $15 per person. All rooms have opening double glazed windows, and guests can rest easy with 24 hour CCTV property surveillance. Guest Laundry is available for just $6 per load - wash & dry.